With an increasing number of pest and disease introductions into New Zealand over the last decade farmers in New Zealand need to become more biosecurity aware to protect themselves and the rest of our rural community. Not only should we be aware of exotic disease introduction, but also of pre-existing diseases which are an ever-present threat to your farms animal welfare, productivity and profitability. By limiting the movement of infected stock and disease transfer through contaminated vehicles, equipment and clothing we are not just reducing the risk of Mycoplasma bovis, but also the likes of Salmonella, BVD, Rotavirus, Pinkeye and Johne’s to name a few. It will also provide farmers some structure in the event that Foot and Mouth virus were to ever make it to these shores. The aim of this document is to be an extension of the of the ‘On Farm Biosecurity – Top 11 Checklist’. It provides a bit more detail, with some tips, hints and suggestions for customising a biosecurity plan to your farm operation. These details/suggestions will be built on over time. Make sure that as you personalise your own plan, you involve all farm staff so that everyone becomes engaged with the common goal of keeping your herd safe. Mycoplasma bovis is mainly spread by; close contact between animals, via the milking machines and feeding milk from infected cows to calves. • New incoming stock and nose to nose contact over boundaries are the biggest risk for the introduction of the disease to your farm. • Vehicles, equipment and protective clothing that have been on other farms pose a real but far lesser risk. These should be cleaned and disinfected before coming on your farm. • Mycoplasma bovis unlike most bacteria doses not possess a cell wall. It is therefore easily killed by sunlight, heat and drying and almost all disinfectants but it can persist in cool-warm, dark damp conditions. • Have one farm entrance that can be closely monitored. The biosecurity check point should be ideally sited at the start of this. • Close extra road side gates. Consider chaining closed and using a combination lock. • Physically go out and check that all boundary fences are secure and well powered. • Where nose to nose contact is possible with stock from other farms, create a buffer zone by double fencing - 2m should be sufficient. If planting a shelter belt use 3m. • Reduce the likelihood of grazing boundary paddocks at the same time as your neighbour. • Be considerate about grazing dry, young stock or culls in boundary paddocks continuously. • Does stock really need to be moved along public roads? • Check with surrounding farmers to make sure there is no possibility of your stock boxing in with others. • Make sure stock movements are well controlled. • For permanent stock crossings, consider installing cattle stops. • Does the risk of road side grazing really outweigh the benefit? • Area where no stock can enter. • Treated as a public zone. May include: tanker tracks, tracks to the cattle yards, house driveways. • Intermediary areas for incoming stock, suspicious animals, placement of foreign animals, cows for pet food pick up, quarantine. • Does not have to be a large area of land. • Areas where stock graze or effluent has been spread. • No visitor or machinery access, unless they have followed biosecurity procedures (cleaning & disinfection). 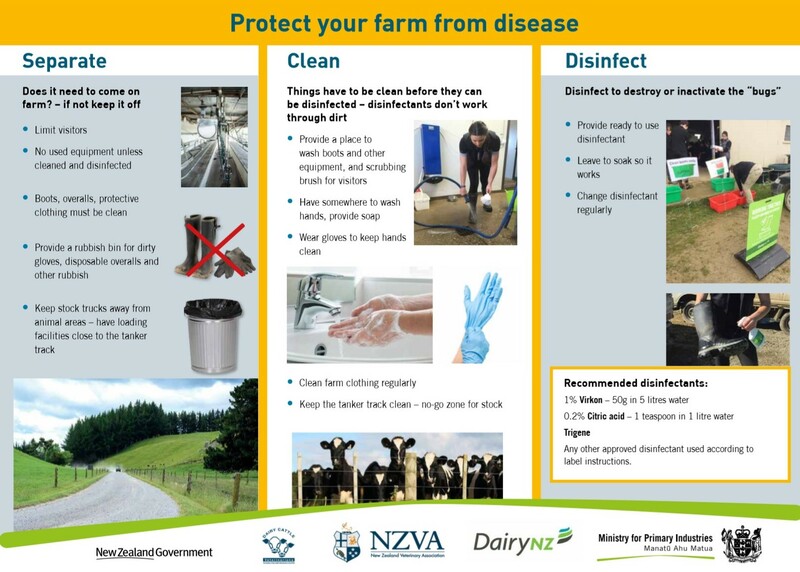 • At entry point to farms: have a sign in book , phone numbers, farm hazard map and biosecurity zone farm map (green, blue, red), a checklist for visitor procedure, foot bath with scrubbing brush. • At dairy shed, calf pens, cattle yards and loading race: A foot bath with scrubbing brush. This should be used before entry and also upon leaving farm. • Recommended broad spectrum disinfectants are Trigene/Sterigene 10ml/L, Envirosan (20mL/1L water) or Virkon (100g/10L water). • Be aware that once in solution Envirosan and Virkon will lose potency in 1-3 days. When Virkon loses its colour and smell it is no longer potent. • Trigene/Sterigene can remain potent for greater than 2-4 weeks in an unused solution. • Trigene/Sterigene will gives the longest performance in a boot wash, but should be changed at least weekly if under constant use. • All will be compromised by mixing with organic matter/mud. If it looks dirty tip it out and replenish. • All agricultural contractors, machinery and cultivation gear need to be clean before entering the farm and disinfected before entering the red zone. • This should be communicated to your contractors - it is up to you to make sure agreed procedures are adhered to. • All other service vehicles are to remain in the green zone, including vets, irrigation service vehicles, electricians etc. • An on-farm vehicle, such as a four-wheeler, could be provided if they need to go elsewhere on farm (be conscious of health and safety implications). • Provide the facilities for vehicle wash down and disinfection for contractors exiting the farm. • Avoid bringing equipment onto farm that can carry infectious disease. For example calf de-budding equipment, hoof trimmers, scales and platforms, calf pullers, stomach pumps, calf trailers. • Follow cleaning and disinfection procedures for equipment that is shared between farms. • PPE (personal protective equipment) such as gumboots and wet weather gear that have been on other farms (local or international) can spread disease. For example PPE worn by relief milkers and calf rearers. • Supplying and leaving PPE on farm would be preferable. Consider having some spare PPE for visitors. • NAIT record all stock movements in and out, including calves going to grazing, cull cows, bulls. • NAIT tagging is a legal requirement and is the best way to help control infectious diseases and outbreaks. ALL ANIMALS MUST BE NAIT TAGGED! • Can your agent supply a declaration of herd health status? • Assess the level of risk when purchasing from a new herd or yarding - multiple lines within a lot, closed herds versus open herds. • Talk to your grazier about managing grazing plans to avoid nose-to-nose contact with other stock, especially where grazier is running multiple lines of stock. • Where feasible, ensure a 24hr stand down period between shared use of yards. This will require communication and co-ordination with other users, especially during mating or start or end of winter. • If this is not practical disinfect high contact areas such as races, forcing pens and loading ramps • Look to implement a red/green/blue zone, and biosecurity plan with graziers as per the plan for the milking platform, the same concepts apply to dry stock farms. • Treat your animals as new arrivals when they return to the home farm. • All trucks should arrive for loading in a clean state. • Consider disinfection prior to loading. Target areas where nasal or oral secretion may have been deposited and then be subsequently licked or sniffed by your stock. • It takes about 1.5-2hrs to fully wash out a truck unit, plus mileage if needed, so disinfecting on farm is a good option. • It takes about 100L of mix in a tractor type spray tank to spray out a truck and trailer unit. • Use a gorse gun (with the nozzle on fan) and you will need a 30m long hose. • Concentrate on spraying the walls and roof, behind hinged doors and tail gate. • Spray all top deck fold down floors while standing on the bottom floor. • The floor is of lesser importance. • Spray the bottom deck first, load the stock, then spray the top deck. It takes around 15 minutes to spray the whole unit. • If there is more than one truck then you can spray before they back in. • Milk, calf bedding and effluent can all carry infectious diseases. Therefore, they should be handled with caution and ideally not be removed off farm. • All new stock arriving on farm should have a 7 day stand down, or quarantine period, before introduction to the existing herd. • Ideally, this would be in a blue zone (if feasible). If not, then contact with other stock should be avoided in this period. Milk last if lactating. • These stock should then be monitored for signs of disease, for example, mastitis, lameness (swollen joints), or abortion. • Take particular note of high rates of dry period or springer period mastitis.